An Experiment on a Bird in the Air Pump. 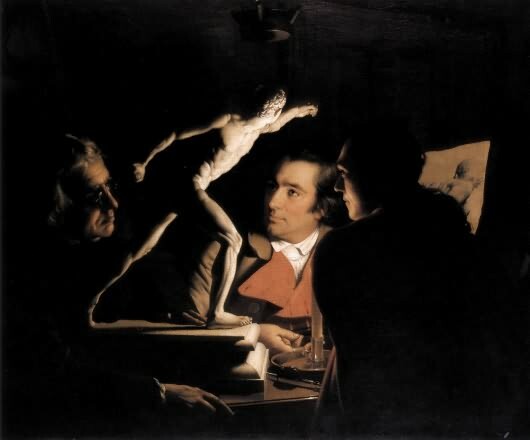 Joseph Wright ‘of Derby.’ The proverbial canary in the coal mine is dead. An outline of how the primary means of scientific communication has been corrupted and perverted by capitalist ideology. Ruins of Rome. Giovanni Paolo Panini. Rome circa 298.456239 kelvin. We use time as the fourth co-ordinate. Could we replace our co-ordinates with measures of physical parameters? Probably not. The Falling Star. James Hamilton Hay. A morbid Toronto Ritual - "Injury at Track Level"
The Seven Legends: Self Portrait. Albert Richards. Not enough oxygen and you become blue in the face. Albert Richards was the youngest of three official British war artists to die in combat during WWII. Do scientists merely make conclusions based on what they observe or do they rather construct a conclusion with support of their observation? We present an argument that gaps exist between what scientists know and what they conclude and that these gaps are both unavoidable and potentially useful.